Use your maker skills and become the Jedi you were meant to be! Construct your own lightsaber using 3D printed parts and electronics from Adafruit. This advanced prop uses an accelerometer to detect swings and hits to trigger super bright NeoPixels with full sound FX! Designed to be 3D printed with multi-material setups for creating custom color combinations. This prop is released as an open source design. Built-in access to the Adafruit Prop-Maker FeatherWing and made to be taken apart and reassembled. It's not just for show, we engineered it to take heavy hits*! Will you join the light side or the dark side? Our previous prop builds required wiring many boards together to get what essentially is a Prop-Maker FeatherWing. For example, our Ray Gun project employed a micro-controller, audio amp, sound effects board, accelerometer, usb lipo charger, laser module and a perf-board to put it all together. Thats a-lot of wiring! We think the Adafruit Feather form factor is the perfect size for building props. With the FeatherWing ecosystem, you can easily add-on new features! The Prop-Maker FeatherWing is designed for creating advanced props using motion, lights and sound. The LIS3DH accelerometer can detect steps, swings and hits. It has an on-board class-D audio amp for blasting sound effects. For creating stunning lighting effects, the built-in NeoPixel driver and 3W RGB LED driver are essential. The hilt design features two buttons for controlling the blade. The clamp allows for any 16mm diameter panel mounted buttons. The length of the buttons are limited to the inner diameter of the hilt (40mm) which accommodates any of these buttons. We designed the hilt to be 3D printed with multi-material extrusion but we also offer parts for single extruders. One of the main goals for the hilt was to have the ability to access the electronics via door or hatch. The Prop-Maker FeatherWing is accessible through an opening on the side of the barrel. This allows for adjusting volume, accessing the reset button and any of the on-board components. With all of the components the saber weights about 1.5lbs (0.68 kg). Removing the blade from the hilt allows for transporting – So it's great for taking to cons and events! So who's crazy enough to design build their own lightsaber? A Maker, of course! We hope to see both software engineers and mechanical designers use the Adafruit Feather and Prop-Maker FeatherWing to build their own props. Please use our guide as a reference. 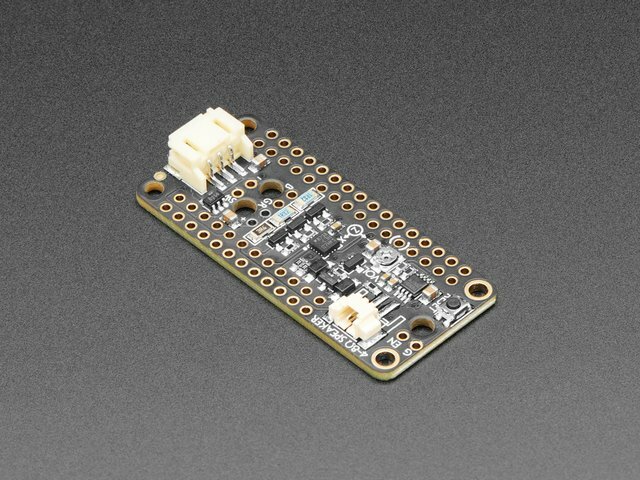 The Prop-Maker FeatherWing is fitted on top of Adafruit Feather M4 Express via short female/male headers. 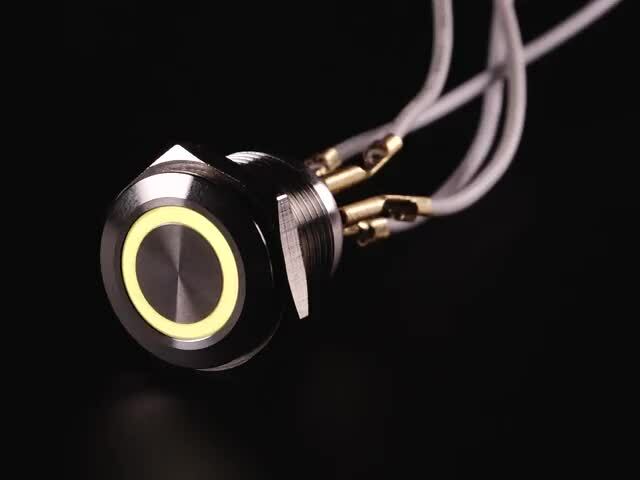 The RGB LED metal pushbutton uses several connections that are wired to the FeatherWing. The speaker is connected via a molex pico blade connector. The battery uses a JST PH connection that plugs in directly to the Adafruit Feather. Tying the enable and ground pins on the Feather will essentially shut off the power – Use a 16mm pushbutton with on/off latch. If you'd like to keep the two buttons in the hilt as momentary push buttons, you can optionally solder a slide switch directly onto the Prop-Maker FeatherWing. Install the necessary Adafruit CircuitPython libraries by downloading the latest bundle. Unzip the file and locate the needed libraries. Drop the libraries into a folder named "lib" on the CIRCUITPY drive. Before continuing make sure your board's lib folder or root filesystem has the neopixel, adafruit_lis3dh, and adafruit_bus_device files and folders copied over. The code was written to call on five different sound effects depending on the actions. You can make your own audio files or use the royal-free ones we've provided. Be sure to create a new folder named "sound" on to CIRCUITPY drive and drop in the audio files. Adafruit CircuitPython supports 16-bit, Mono, 22.050kHz .wav audio format. Play a WAV file in the 'sounds' directory. this, e.g. passing 'foo' will play file 'sounds/foo.wav'. Animate NeoPixels with accompanying sound effect for power on / off. if elapsed > duration:                   # Past sound duration? # because interrupts are disabled during the transfer. # back by 30 microseconds per pixel. Blend between two colors with a given ratio. if not switch.value:                    # button pressed? power('on', 1.7, False)         # Power up! Use these numbers to reference if these parts will fit on your 3D printer. Parts that can be printed with multi-material setups are labeled with an "A" and "B" suffix. Machines with multi-material setups will need to be configured using their own software tools for slicing parts. The parts in this project were 3D printed with Ultimaker 3 and sliced with Ultimaker CURA 3.X. Barrel houses the circuit board retainer. Attaches to barrel and battery holder. Houses 2x 16mm panel mounted pushbuttons. Stores the 4400mAh power cell. Houses the 40mm speaker. Screws onto the power cell holder. Single extrusion parts are labeled with "single" as the suffix. These parts were merged for 3D printing with a single extrusion machine. Additional post-processing can be done after printing. These pare are separate from the hilt and can be 3D printed with any extrusion setup. Mounting bracket for the Adafruit Feather. Mounting bracket for the Adafruit Prop-Maker FeatherWing. Press fits onto 1" OD polycarbonate tubes. Use translucent PLA material for best light diffusion. This animation demonstrations how all of the pieces are assembled to form the hilt. The emitter screws onto the barrel. The clamp attached onto the barrel and power cell. Pommel screws onto the bottom of the power cell. An M3 x 16mm screw and nylon lock nut is inserted into the clamp and secures the assembly. The material used to print the parts in this project are from Fillamentum. From the PLA Extrafill line of filaments, Vertigo Galaxy PLA, Rapunzel Silver PLA, and Vertigo Gery were used. Material comes in 2.85mm and 1.75mm diameters. The pommel and emitter parts feature threads that tend to have tight tolerances straight off the 3D printer. These parts may need to be dry fitted a few times to loosen up the tolerances. Gradually fasten the parts by twisting them together. If needed, a filing tool can help smooth out the edges. The RGB LED push button will be connected to the Prop-Maker FeatherWing. 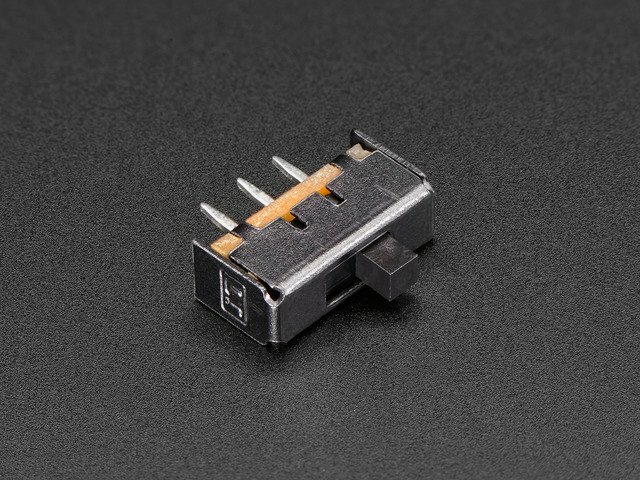 To make assembly more efficient, we suggest using JST-PH connectors – These allow quick connections of components. Pre-made cables are available and linked the overview page. The RGB LED buttons require a total of six wired connections, so a 4-pin and 2-pin JST connector can be used. We suggest using a wire length of 62mm (2.4in) for each connection. The second button is extra and does not serve any functionality. Pre-made JST cables are convenient but making durable connections can be achieved using silicone cover stranded wire. This 28AWG ribbon cable is really nice wire that is flexible and won't easily break. Using this wire and a JST-PH connector kit, you can create custom JST-PH cables. Take a moment to plan which wires you'd like to use for the buttons. Colored heat shrink tubing can be used to differentiate the connections. Each wire is about 62mm in length (124mm / 4.8in total length). Pins of the RGB LED button are labeled on the bottom of the plastic body. Reference these labels to match the wires with the RGB LED pins on the Prop-Maker FeatherWing. The polarity will need to match. A 16mm panel mounted button doesn't require matching polarity, so this can be soldered to which ever pin. 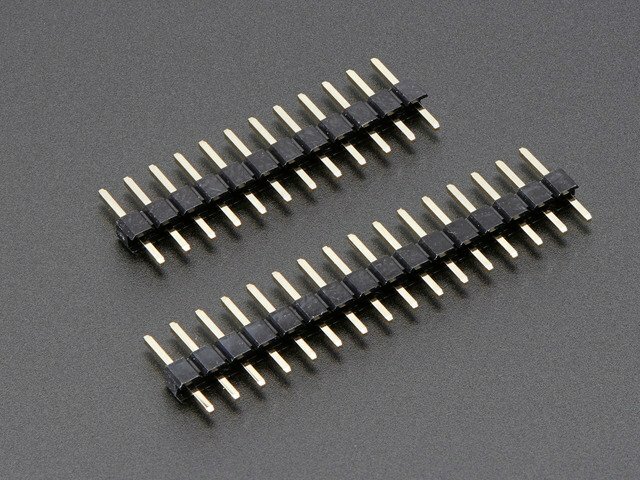 These can connect to an available GPIO pin on the Prop-Maker FeatherWing. Double check the wiring to ensure the buttons have solid connections. Now is a good time to check the wire lengths and trim any excess. The tips of the wires can be tinned with a bit of solder to make attaching them to the pins easier. To make assembly more efficient, the switch wire is soldered to the bottom of the Prop-Maker FeatherWing. Reference the labels and solder a 2-pin JST cable to the SWITCH and GND pins. Reference the RGB labels and solder a 4-pin JST cable to the Red, Green, Blue, and V+ pins on the FeatherWIng. If you plan to write the second button, use an available digital pin, NOT the IRQ pin (it's used for the accelerometer to talk to the Feather M4). Double check your soldering to ensure the connections are solid. The Prop-Maker FeatherWing features an on-board molex pico blade connector for audio output. The speaker will require a longer wire, so you will need to extend the cable using additional wires. The blade is made from a thick 1in OD polycarbonate tube and an Adafruit mini skinny NeoPixel strip (1-meter, 144 pixels). The amount of pixels will be determined by the desired blade length. We suggest using sourcing a good quality tube from online shops like UltraSabers.com and TheCustomSaberShop.com. The tubes from UltraSabers.com are available in medium and heavy grade polycarbonate. These ship with press-fitted resin casted tips and include an inner plastic light diffuser. They're available in different lengths that are pre-cut. Tubes from TheCustomSaberShop.com are less expensive but bare. These require DIY inner diffuser and tip. They're not as thick as the heavy grade polycarbonate tubes from UltraSabers.com. These can be pre-cut in size of your choosing, up to 40in length. The Adafruit Mini Skinny NeoPixel strips use NeoPixel Mini 3535 RGB LEDs on a flexible PCB. We found these smaller NeoPixel LEDs can fully illuminate the tube and evenly diffuse light. These do not require a second strip! We see benefits in using Mini Skinnys because you save cost on parts, less wiring work and longer battery life! 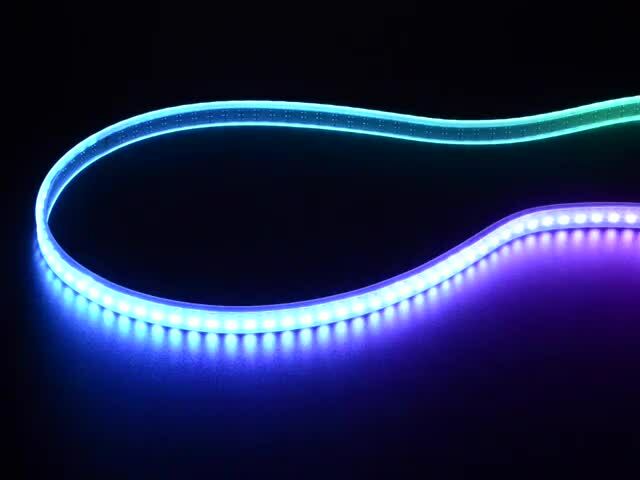 Standard size RGB LED strips can be used but may require two strips to fully illuminate the polycarbonate tube. A strip of corrugated plastic sheet, sometimes referred to as Coroplast, is used to create a backing for the LED strip. This will make the strip more ridged and easier to insert into the polycarbonate tubing. We used a 20in x 30in semi-translucent sheet that was 4mm thick with 4mm wide corrugations. To fit within the inner diameter of the polycarbonate tube, you will need to measure and cut the sheet down to two strips. These strips will need to be the length of your desired blade. For longer blades, use clear tape to join multiple strips together. Most NeoPixel strips ship with pre-soldered wires and a weather protective sheathing. The wires and sheathing will need to be removed in order to fit the LED strip into the polycarbonate tubing. Carefully use a box cutter knife to remove the hot glued tips from both ends of the the flexible PCB strip. Use a soldering iron to remove the wires, we'll replace them with a 3-pin JST-PH cable. Connect the wires from the 3-pin JST cable to the end of the NeoPixel strip with data in (as noted by the arrow goin to the right direction). Reference the labels on the strip and photos for matching polarity. We suggest using a set of third helping hands to assist in holding wires in place while soldering. 5V (red) is on the left, Data-In (white) middle, Ground (black) on the right. Pulling and twisting the cable will eventually wear about the strands of wire. To reduce the amount of stress from excessive handling, use hot glue or a silicone-based adhesive over the solder pads. Double check your wiring to ensure the polarities are correct. The 3-pin JST connector can be plugged directly into the NeoPixel port on the Prop-Maker FeatherWing. Power the Adafruit Feather on by plugging in the lipo battery. Use the button switch to activate the NeoPixel strip. The number of pixels and length of strip is dependent on your desired blade length. We created a 24in and 32in blade in our builds. The numbers below are from a 144/meter Mini Skinny NeoPixel Strip. Use flush cutters to cut in between the copper pads on the flexible PCB. We'll sandwich the Mini Shinny NeoPixel strip in between two strips of corrugated plastic. I suggest using double-sided nitto tape to secure the LED strip to one of the plastic sticks and then wrapping the second stick on top with clear tape. The second stick provides stability and light diffusion necessary for even illumination. Double-sided nitto tape has a strong adhesive that is good for sticking things together. Cut several strips and spaced them out. Evenly distribute the strips of tape across the length of the plastic strip. Carefully remove the protective film from the top layer of each strip. Position the LED strip over the plastic stick and slowly lower onto the tape. Inch the strip onto the tape by pressing it down. Try to keep the strip straight and true. Place the second plastic strip over the LED strip and wrap clear tape around to secure them together. Hold the two strips together while apply the tape. Try to keep the edges straight and true. Power on the circuit to test out the LED strip. The connections should be capable of hand handing and a bit of movement but take care and treat it delicately. Insert the LED strip assembly into the polycarbonate tubing. The light source is thin enough for it to wrap around the other side and illuminate the tubing. There is a slight variation in the brightness at close inspection but looks fully lit for the most part. The LED strip assembly needs to be secured to the tube or else it will fall out. To keep it in place, use clear tape or hot glue to seal the bottom of the tube. A bit of light leaking near the bottom tube is fine and will actually add a slight lighting effect to the FeatherWing. The polycarbonate tubing is press fitted into the blade emitter. Insert the 3-pin JST cable through the top opening of the emitter and carefully press the tubing. Firmly grasp the tubing and emitter while forcing them together. You may use... the force to do this (couldn't resist!). At this point we can test out the LED strip again. Take a moment to make tweaks if necessary. I found the light diffusion in the blade construction to be interesting. Originally I used two strips of high density, 5050 NeoPixel strips. I was surprised to find a single Mini Skinny NeoPixel strip could decently diffuse the tubing. There is a slight variation in brightness on the backside but it's not that noticeable. Feel free to experiment with different strips, DotStar LEDs even! I constructed two blades with different lengths and can swap between the two! The Adafruit Feather and Prop-Maker FeatherWing PCBs are secured to separate mounting brackets. When the boards snap together they form a retainer that slides into the barrel of the hilt. Use the following suggested hardware to secure the PCBs. Use an M2.5 size tap to create threads in holes of the 3D printed mounting brackets. Hold the PCB and mounting bracket together while inserting a machine screw through one of the mounting holes. Use a screw driver to fasten the screws into the brackets. Fasten the threaded inserts to the screws tightly to secure the parts together. Reference the photos for correct orientation. Repeat the same process to secure the Prop-Maker FeatherWing to the mounting bracket. I used needle nose pliers to tightly fasten the threaded inserts. I found hex jam nuts to be too big for them to sit beside the headers. The orientation of the Feather PCB and Prop-Maker FeatherWing are in a way where the micro USB connector isn't easily accessible in the hilt. Use a micro USB cable and micro USB breakout board to create an extension. The microUSB breakout PCB features two mounting holes that can be used to secure the PCB to the Feather mounting bracket. To create this, I cut a micro USB cable (one with data wires!) and soldered it to the pins on the breakout. Orient the two PCBs so the headers and pins match. Carefully connect them by firmly pressing them together. The wiring and cables should be kink free with enough wiggle room. Use 2x M2.5 x 8mm flat head machine screws to secure the micro USB breakout to the 3d printed mounting bracket for the feather. Plug in the microUSB cable to the Adafruit Feather with the cable inside the bracket. Double check your wiring for solid connections. Insert the JST cables from the button through one of the holes in the clamp. Press the body of the button through the hole until it's flush. If needed, use a filing tool or hobby knife to open up the hole to loosen the tolerance. Insert the hex nut through the JST cable and fasten onto the thread of the button housing. Tightly fasten the hex nut to secure the button in place. Needle nose pliers can help assist in grasping the hex nut. The clamp is symmetrical so the buttons can be positioned in either direction. Repeat the same process to install the second push button. Most 16mm panel mounted buttons should fit within the clamp. 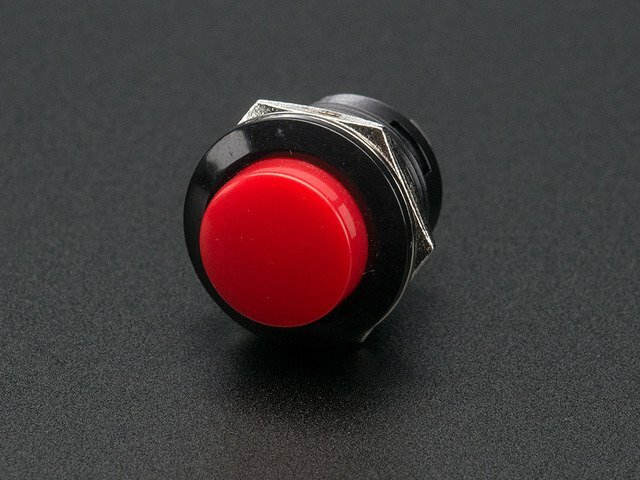 Its about 40mm diameter internal, so as long as the length of the button does not exceed it should fit. Wiring can be adjusted and repositioned for more clearance. Place the 40mm speaker into the pommel with the magnet driver facing up. The body of the speaker resides in the pommel with little wiggle room. It doesn't necessary "snap in". Instead, the battery will keep the speaker in place once installed. 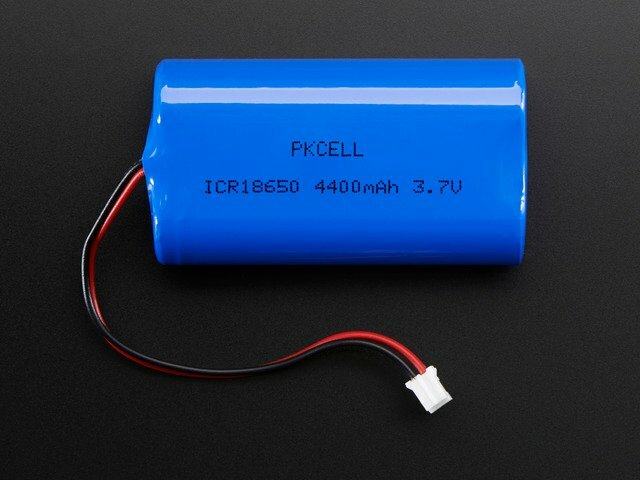 Grab the power cell part and insert the 4400mAh lipo battery through the opening. The battery can only be inserted to one side (the one with the threads). The other side will prevent the battery from being inserted all the way through the part. The JST cable from the battery should be coming out through the top (the side with no threads). The molex pico connector is threaded through a cutout on the inside of the powercell. Pass the cable through and pull through the top of the powercell part. There's two available cutouts to allow the cable to pass through. The orientation of the battery matters and needs to be installed with the JST cable facing the non-threaded opening. Be sure the side of the powercell with threads are close to the pommel. These two will be joined by twisting them together. Threads! Place the pommel over the end of the powercell with the threading and begin to screw it on. Fasten the pommel until it's fully tightened. Be cautious of the wiring as it could be damaged by excessive twisting. Grab the PCB assembly and begin to insert it through the barrel. The cables should go through first. Slowly work the PCB assembly into the barrel by carefully pressing it trough. It the tolerances are too tight, use a filing tool to sand the edges. The micro USB breakout is accessible from the top of the barrel. 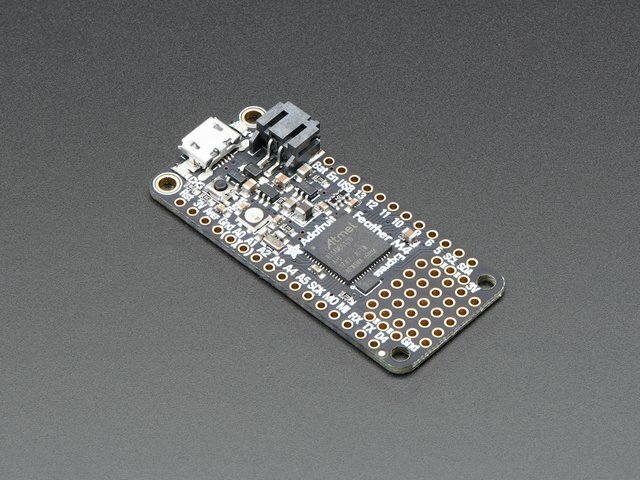 Use this port to program the Adafruit Feather, change sounds, code, etc. Pull the wires through the bottom opening of the barrel. The bottom of the barrel will not allow the PCB assembly to pass all the way through. Grab the clamp and orient it with the Powercell. Insert the speaker and battery cables up through the clamp. Bring them together and press the clamp over the powercell. Line up the groves and twist to lock them together. Grab the JST connectors from the wiring assembly and check everything is accounted for. Bring the barrel close and plug in the JST connectors. Take a moment to thoroughly inspect the wiring and ensure the connections and polarities are matching. Pull the pico connector from the speaker through the opening in barrel. Rotate the PCB assembly to better access the speaker port on the Prop-Maker FeatherWing. Plug in the connector to the speaker port. Use your thumb to pull apart the clamp and insert the barrel. Twist the parts until they the notches line up and lock into place. Make sure not to dislodge the clamp from the powercell. Pull the JST cable from the battery through the opening in the barrel and connect it to the battery port on the Adafruit Feather. You may need to adjust the PCB retainer by turning it to one side to better access the port. If the PCB retainer gets stuck, you can use a file tool to loosen the tolerances by sanding the edges. Insert a M3 x 16mm long machine screw through the hole in tab of the clap. Press it all the way trough and insert a nylon lock nut onto the thread of the screw. Use a screwdriver and pliers to securely fasten together. 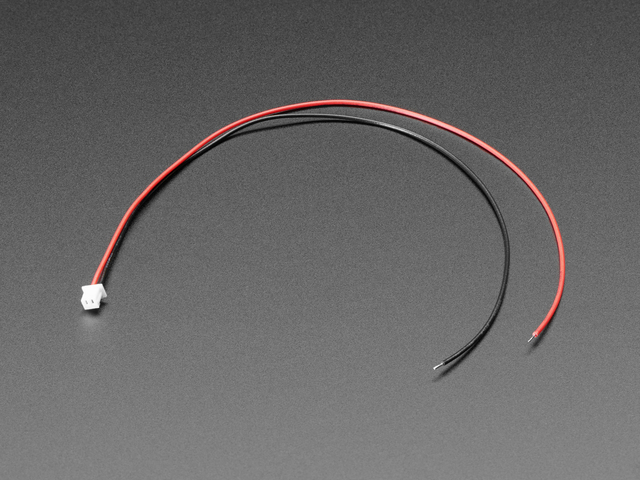 Grab the 3-pin JST cable from the blade and insert it it into the NeoPixel port on the Prop-Maker FeatherWing. The PCB retainer may need to be adjusted to better access the JST port. Wrap the wiring inside of the barrel and begin to twist the emitter onto the barrel. The screw threads mate together and are fastened tightly. The Emitter is designed to be removed by unscrewing it from the barrel. The micro USB port is accessible with the emitter removed for recharging the battery or programming the Adafruit Feather. Give your saber a test by winging it around (careful not to knock anything over!). The durability of your saber lies in your construction. Take the time to true up any edges, shorten or adjust wires and cables. The Adafruit Feather series has a built-in battery charger with the microUSB port. However, it only has a charging rate of 100mAh – That means it would take 44 hours to fully recharge a 4400mAh battery! 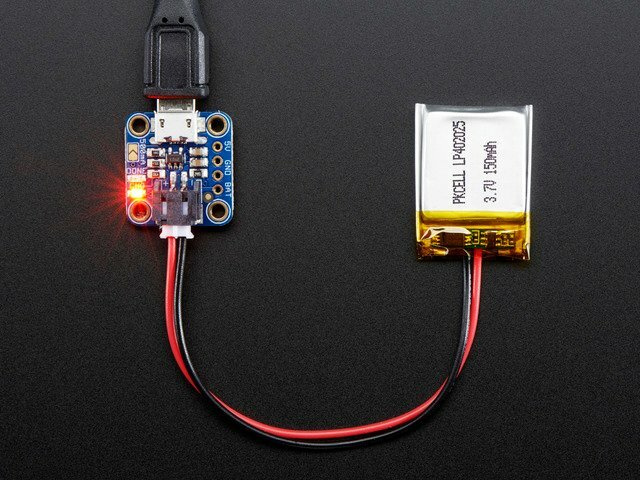 For a faster charge, we recommend using the Adafruit Micro-Lipo Charger – This has a charging rate of 500mAh (0.5A jumper must be soldered) so it only takes 8 hours to fully recharge a 4400mAh battery. Only use Adafruit Micro-Lipo Charger to charge lithium ion packs from Adafruit!! Other chargers could potentially cause damage. The Adafruit Feather and Prop-Maker FeatherWing are accessible by unscrewing the blade emitter. Use the microUSB breakout extension to update code, flash new firmware or recharge the battery (although slowly!). Depending on how the Feather and FeatherWing are oriented, the opening in the hilt allows access to the RESET button, audio volume trim pot, and JST connectors for the speaker and battery. This guide was first published on Oct 31, 2018. It was last updated on Oct 31, 2018.